All of the tulips behind my house. My father had a green thumb. I don’t know if he was born with it, or if he cultivated through during his lifetime, but he was great at making plants grow. He loved planting gardens of flowers and vegetables and whatever he touched thrived. His efforts to create vegetable gardens didn’t always go well due to animals finding their way past garden defenses, but his flower beds always thrived. While I’ve had some success growing things, I did not inherit my father’s knack for making green things grow. I’ve killed cactuses and other low maintenance plants and my annual flower gardens have been hit and miss. I’ve discovered that pansies and snapdragons seem made to survive my lack of green thumb, but I haven’t had much luck with perennials. Well, lucky for me, my father’s spirit decided to help me with that problem. A few years’ ago, a tulip plant suddenly appeared growing next to the irises behind my house. Those irises have been here since before I moved in and they always do extremely well, but I’d never planted any tulips. I took that first tulip that produced a single red blossom as a gift from my father’s spirit and I thanked him profusely. That tulip has returned every year and I’m always amazed that the squirrels, rabbits, woodchucks, skunks, or deer don’t manage to nibble it away before it can bloom. Apparently, this year my father decided I needed a few more bulbs in my yard. The first new plants I saw were a couple of yellow daffodils growing over by my smaller shed. I didn’t plant daffodils and I’d never seen them there before, but there they suddenly were one day! 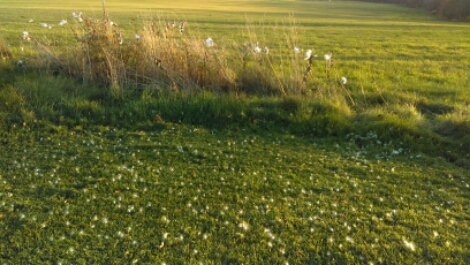 When I first saw the splash of yellow next to the shed, I wasn’t sure what I was seeing, especially since the weather hadn’t been warm enough for dandelions yet. I was bewildered when I walked over and realized they were healthy daffodil plants dancing in the chilly breeze. The daffodils by my shed. Once again, I thanked my dad’s spirit for the gift of flowers and figured that was his new flower for this year. I soon learned that I was wrong. Shortly after the daffodils came up, I went over to investigate my usual tulip and discovered more tulip plants growing a bit further away from the first. Again, I didn’t plant any more tulips so I was surprised to see them. I thought perhaps they were more red tulips and that they were finally growing because I’d cut the rose bush back more. I was happy to see more tulips growing and appreciated my father’s continued efforts to add flowers to my gardens. As the weeks passed and the tulips continued to grow and create buds, I noticed that the new plant had five buds on it as opposed to the single bud on the red tulip. After a couple more days I realized that the second tulip plant was a different color than the first tulip plant and when it finally started to show its colors, the buds were a lovely combination of yellow and red. I was elated that such beautiful tulips were growing in my yard when they bloomed and revealed their stunning colors, I nearly jumped for joy. My father’s spirit had certainly upped his game this spring! The original red tulip and this year’s new addition. I’ve been enjoying the colorful displays of tulips behind my house for the past week or so and even though the blossoms are starting to fade and wilt, I’ve taken plenty of pictures to remember them by. Plus, I know they’ll be back again next year. The gift of flowers that my father’s spirit keeps giving me is something I’m truly grateful for and I wish he were still physically around so I could thank him in person and give him a huge hug. I’m sure there’s a lot my dad could do with my property if he was still alive and I’d welcome his help. I always make grand plans for gardens on my property, but I don’t have the time or resources. Instead, I just make my little backyard container garden around the birdfeeders and admire it from my kitchen window or when I’m outside on the deck or in the yard. The birds also help me out by dropping enough sunflower seeds to sprout at least a couple nice sunflowers every year. Although I may never have the beautiful gardens my dad used to create, I do the best I can to keep up with my property and incorporate pretty (and resilient) flowers where I can. It’s nice to know that my father’s spirit seems to understand that I’m trying and that he helps me out as best he can. For as long as I live in this house and even after I move, I know I’ll wait anxiously for spring every year to see if my father has planted more gifts of flowers for his little girl. Standing by one of my dad’s flower gardens. 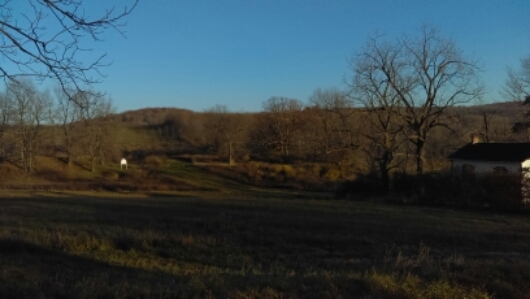 A sunny, 70 degree day in November in Upstate NY must be appreciated for the wonder that it is so I spent yesterday appreciating the unseasonably warm autumn day in many ways. Considering that the forecast is calling for snow starting Sunday, I’m sure I’ll wish I could bottle yesterday and open it in the midst of winter cold. My original plan for the morning was to mow some of my back yard after the girls got on their busses and the grass dried out a bit. To that end, I hooked my mower battery up to the charger and let it sit charging for a while as I tidied up the deck, put plants away, emptied water out of my deck storage totes and so on. For whatever reason, mower batteries don’t seem to last for more than a year so I just hook mine up to the charger before I mow, give it time and it usually starts. Well yesterday, it didn’t want to start. Not one to waste the amazingly warm morning, I left the mower hooked to the charger and finished putting my deck and yard furniture away in my sheds. I then decided to string up the colored icicle lights on my front bushes since it’s never a fun job when my hands are frozen. My bushes still have leaves on them but that didn’t hamper my lighting efforts and now the lights are all set and ready to be turned on whenever I so desire. I’m not one to wait until after turkey day to decorate for Christmas so they’ll probably be on at night rather soon. By the time I was done tidying up my outside areas, there wasn’t enough time left to mow before I had to pick up my youngest daughter from school. She had half days this week and I babysat her Wednesday and yesterday until her father could pick her up. I always love more time with my girls so it’s never a problem taking them. Although there wasn’t time to mow, there was time for a short walk with Jazzmin so she and I set out. It was shortly before 11 a.m. when we headed out for our walk and it was so nice out that I was wearing shorts and a tank top! 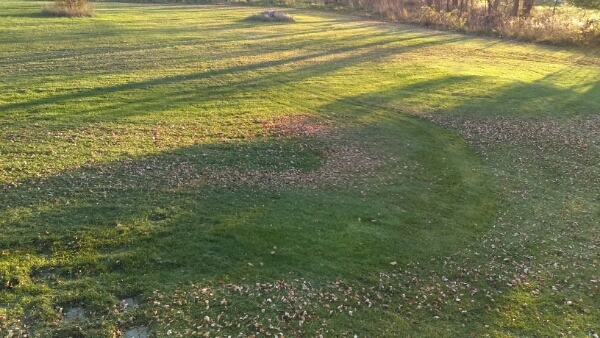 It’s a rare treat indeed for it to be warm enough for that in an Upstate NY November. Jazzmin loved the walk as usual and when we got back, I packaged up my latest order of earrings to ship to their new owner. I’m always happy when someone else loves my jewelry as much as I do! It inspires me and motivates me to create more lovelies, which is extremely helpful since I need to build up more inventory after a run of successful sales. After picking my youngest daughter up from school, we stopped at the post office to mail the earrings and then headed home to enjoy the afternoon. She spent quite a while swinging in the warm sunshine and was happy to be done with school for the week. It was lovely having her for some bonus Friday time. 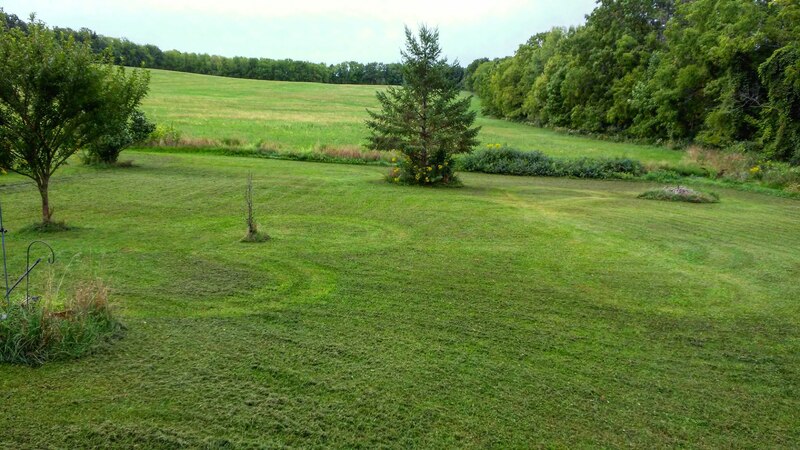 I finally managed to get the mower running and did the section of the back yard that was especially long but left the rest unmowed and covered with leaves. When Jaycie’s father picked her up, it was 3 p.m. and still just too nice to stay inside so I decided to take Jazzmin for a second, longer walk. We went up the big hill and relished in the sunshine and warmth. There were grasshoppers jumping across the road, crickets chirping in the fields, peeper frogs in the ponds and streams and I even saw a small yellow butterfly fluttering by. Once we got back home, I gave Jazzmin her post walk treat and headed out into my back yard in bare feet. 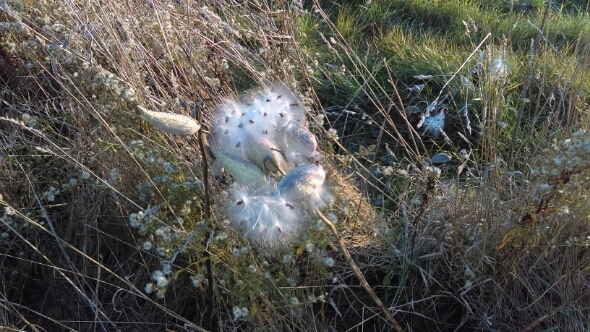 I walked back to the small crop of milkweed plants growing by the southeast corner of my property and smiled at the abundance of white fluffy seeds bursting free of the plant pods. 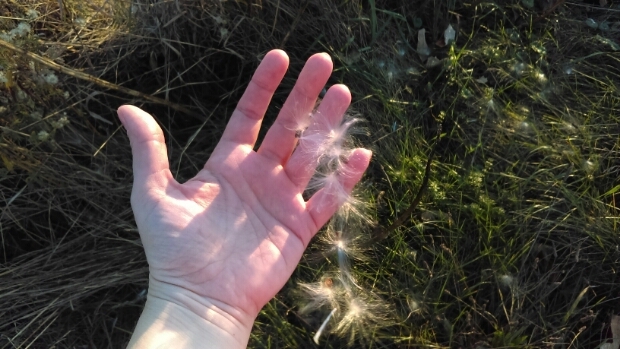 I grabbed a few handfuls of seeds that were trying to work free of the pods and sent them into the air to carry my wishes and gratitude through the breeze. If the calendar didn’t say November, I would’ve sworn yesterday was an early spring day and not a late autumn day. 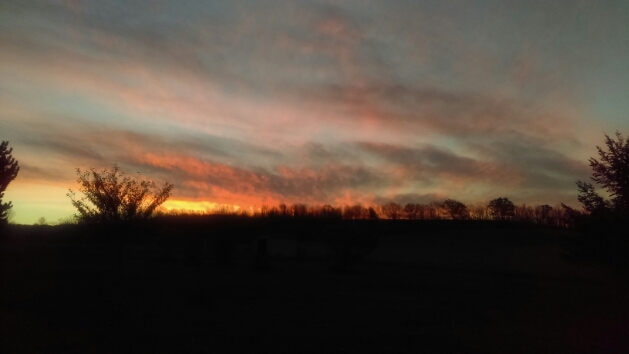 It certainly made me feel that November had given all the nice days it could and wanted to go out on a high note. I think it accomplished that perfectly. As this isn’t my year to have my daughters on the 4th of July, I have a day of independence that I’m using to get work done. The girls and I already celebrated the holiday by going to my mom’s for dinner on Saturday and then standing out on my deck to watch the fireworks display from my neighbor two houses down. Nothing beats being able to stand outside in the dark in my pajamas on my own deck and see a stunning array of fireworks. I didn’t have to worry about parking or crowds and when the show was over, we could all just go to bed. I’ve already accomplished two major tasks this morning because I wanted to beat the heat. I trimmed my front bushes (I call them my arch nemesis) without any major injury and then mowed the weeds down in my back yard. My grass hasn’t grown much due to lack of rain and that’s fine with me because I don’t like mowing, but the tall weeds were making it look a bit too much like a field. The front yard has a similar issue but not as bad, so it can wait for another day. It was already 80 degrees when I finished yard work at 11 a.m. and with very few clouds, it was getting hot fast. My front bushes before trimming. My front bushes after trimming. I’ve now showered to remove all of the bush trimmings and blown dirt and grass from my hair and body and I feel human again. I will be spending the rest of the day writing freelance so I have less to write when I have my daughters. It’s a challenge working from home in the summer because the girls groan when I say I have to write, but I do my best to limit the hours I work when I have them and I take breaks to spend time with them. I hope that someday my daughters will understand that they’re the main reason I started working from home and realize that I did it to have more time with them. Stealing away a few hours every day to work in my bedroom while they play in the living room is far better than being away from them for an entire day working in an office toward someone else’s dreams. I’m doing my best to show them that it’s possible to have a job you love and not just survive as an independent woman, but also thrive and be happy. Invisigirl and the Yard Stick of Tallness! I feel as small as this lizard in big box stores sometimes. I’m a single mother and I own my own home, which means that aside from advice, tips and suggestions from friends and the internet, it’s up to me to maintain and fix my house. Homes don’t come with an owner’s manual and my father never sat me down and taught me this stuff so there’s been a lot of learning on the job for me since I bought my own home in August of 2011. One thing I realized pretty quick is that I have a superpower when I walk into big box home improvement stores: I become invisible. When I used to go to stores like Home Depot or Lowe’s with my now ex-husband, we’d immediately receive attention as the customer service employees asked the man with me if he needed any help. I suppose even then I was invisible, but I didn’t realize it. Now that I’m single, I’m usually ignored for a good portion of my time in home improvement stores. Eventually someone asks me if I need help but by then I’ve usually found what I needed because I’ve learned not to expect someone to be there to answer questions. I gave myself the name Invisigirl because there have been many times in my life when I’ve seemed so invisible in the midst of other people that I’ve almost had entire trays of food dropped on me while walking through a restaurant because the server didn’t see me. Admittedly, I’m not overly tall, but I don’t think 5′ 5″ is too short to see either. My height is however, too short to reach certain items and I often have to improvise to reach what I want. Such was the case in Home Depot this past Wednesday when I was in need of the sanding pads for the random orbit sander I already had in my cart. There was an entire wall of sanding pads and the packages contained from 5-20 pads. As I’d never used a sander before and was going to use it to sand my deck prior to priming, I had no idea how many I’d need so I didn’t want to get a huge package. Unfortunately, Home Depot’s clever marketing layout involves placing the packages with 5 pads on the highest rack where I couldn’t reach them even on my tiptoes. After a few minutes of struggling to reach the top packages or knock one down with another package I was holding, I decided I was going to buy the package of 5 even if I discovered later I’d needed the easier to reach 20 disc package. I’m stubborn and determined and I refuse to let a store bully me into buying the bigger, more expensive package just because I can’t reach the size I need. Yes, I could have asked for help, but as there were two clerks standing nearby chatting and neither of them had offered to help, I was dead set on getting the sanding discs without help. To that end, I walked around the center island of table saws, drills and other power tools and across the aisle to where the levels and yard sticks were hanging up. I grabbed a metal yard stick, strode back across the aisle, reached the yard stick up and easily moved the sanding disc package forward and off its hanger. I did that for both grit sizes I needed and then set the yard stick down on the shelf just in case any other short girls or guys needed the magical yard stick of tallness to reach that top row. Quite satisfied with my problem solving skills, I then headed to the deck stain aisle in search of an oil-based stain for my deck that was desperately in need of some TLC. Stains and paints took up an entire aisle and trying to figure out if any of them were oil-based proved frustrating, especially since no one walking by asked if I needed help. Deciding I’d get my stain somewhere where I wasn’t Invisigirl, I went to the checkout, paid for my items and left Home Depot. I stopped at Sherwin Williams on the way home and as they’re a smaller store that specializes in paint and stain, I was helped as soon as I walked in the door. The friendly clerk showed me where the oil-based, semi-transparent deck stains were, helped me pick a color that closely matched the current color of my deck and then went in the back to mix it up. There are times when I don’t mind being Invisigirl, but getting what I needed to repair my deck, wasn’t one of those times. For the past few weeks if the forecast calls for overcast skies and/or rain, it’s pretty certain it will be overcast and/or rain. Even if the forecast doesn’t call for such conditions, it’s pretty certain they’ll arrive. Yesterday the forecast said fog in the morning then clearing and becoming mostly sunny. Well, it was certainly foggy in the morning but it never really cleared and I can count the times I saw the sun through the clouds on one hand. On top of that, the predicted high was 55 and it only got up to 46. I was rather bummed because I really wanted to see the sun after days of cloudiness and rain. I didn’t have much hope for seeing the sun today as when I checked the forecast last night it was predicting rain and clouds all day long. However, when I woke up this morning, the sky appeared brighter than usual and lo and behold, when I looked out the window, I could see the sun! I was so happy I almost did a little dance! I managed to control myself though and went about the usual morning duties of waking the girls, making their breakfasts, packing their lunches and seeing them safely on the bus to school. You can bet I was smiling the whole time though! Plum tree, my back yard and the farmer’s field beyond. After I did a couple freelance blog posts, the clouds had returned but the forecast had changed from all day rain to chance of scattered thunderstorms. I considered that a vast improvement! As it wasn’t raining yet when I finished my work, I decided to tackle cleaning up and arranging my backyard bird oasis. I started the bird oasis two springs ago and every year it’s in the same spot, but always a little different. I put a little fence up around my bird feeder poles and I set planters of flowers around them with a fountain/bird bath in there somewhere. Needs a few more flowers and feeders but otherwise good! I usually move all of my bird feeders off the deck and into the backyard bird oasis, but I’ve grown so fond of watching the birds out my desk window that I’ll be leaving some on my deck this year. That means I have to get a few more for the oasis, but there are two hanging back there now and the finches have already found them and started feasting. Once the bird oasis was arranged, I had some lunch and then took Jazz for our daily walk. The sun popped out a few times as we walked, which helped warm the day up further. 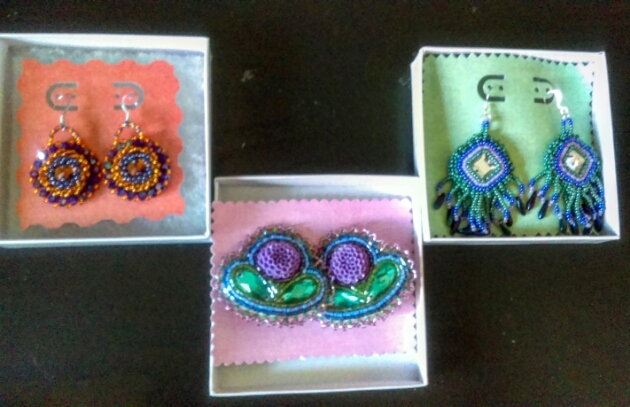 After the walk I eagerly spread the comforter out on my deck swing, grabbed my beading supplies and settled out on the swing to focus on beading up flower earrings. I hooked Jazzmin up to the lead I attached to the deck and as it’s long enough for her to sit in the grass next to the driveway, she happily stayed there watching for squirrels. Beading on that swing with the birds eating at the nearby feeders and Jazz on squirrel patrol nearby is one of my new favorite past times and I beaded away blissfully for a couple hours until I realized it was past dinner time. I wasn’t especially hungry yet, but I figured Jazz was so I brought her inside and got her dinner before assembling my own. Once I was done eating, I was back out on the swing, refusing to waste a single moment of warmth and periodic sunshine after being trapped inside for so many days lately. My beaded flowers and new bead mail. Tons of happiness! Eventually the sky turned rather dark, the temperature dropped and it started to sprinkle as a little rain cloud passed over so I decided it was time to call it a day and head inside the house. I took my beads inside and then went back out to fold up the comforter to bring inside and I realized that my cheeks were sore because I’d been smiling so much while I was beading. My mind, body and spirit had really needed the warmer temperatures, sunshine and fresh air that I got a huge dose of today and although the forecast had been wrong, the day had gone very right! Although the weather forecast changed overnight from mostly sunny today to mostly cloudy, the predicted high was a vast improvement over yesterday as was the lack of rain. I know exactly how cold it was to be outside yesterday because I was at Home Depot in the evening looking for pansies, snapdragons and other flowers for what I call my “bird oasis” behind my house. I hadn’t worn a coat because it didn’t feel too cold to me when I left the house, but walking around outside at the store looking at the flowers showed me just how cold it was as my fingers and face froze. I suppose the chilly weather was a good thing though because I tend to get carried away buying tons of colorful, happy flowers that I’ve browsed through. Browsing happened rather quickly yesterday evening though as I picked out my favorites of pansies and violas along with some new additions of phlox, foxglove and silene (catchfly). Those last three plants are perennials and although I’ve never had much luck with perennials actually coming back, I thought I’d give it a try again. When I got up this morning and saw my flowers still sitting safely on the deck where I’d placed them last night, I knew I had to get them transferred to my planters today, rain or shine. Usually I get the bird oasis set up and put the flowers in the planters all on the same day, but the bird oasis area needs a bit more work than I realized and the grass was still wet so I decided I’d just deal with the planters today. I carried all of the planters from the bird oasis in the back yard to my deck walkway by the driveway and brought the flowers down from the top of the deck to begin the transplant process. I opened all the windows in my car and played the music from my phone through the car radio via my FM transmitter so I had a soundtrack to my gardening. It was still overcast out but considering how easily I burn in the sun, that’s probably a good thing. I had Jazzmin out on her lead with me and she chose to sit in the gravel driveway of all places. There was plenty of soft, green grass for her to lie in, but she preferred to lay behind my car as if she were guarding the driveway from intruders. She did at least keep the squirrels away from my bird feeders by sheer pup intimidation (lying like a lump in the gravel) so that was a nice bonus. I always get my leather work gloves out when I plan on working with flowers, but I never actually wear them because I prefer getting my hands right in the cool, moist soil to move it around and settle the individual flowers in their spots. As I sat on my walkway with my upbeat music blasting from my car speakers I took my flowers out of their store containers and settled them in the dirt of the planters, feeling immensely happy and at peace. It’s impossible for me not to smile when I see pansies because they have such unique color combinations and are hardy enough to survive my oftentimes brown thumb. I didn’t know this until a friend pointed it out to me, but apparently playing in the dirt, i.e. gardening, has scientifically proven mood-boosting properties. Antidepressant microbes in the soil stimulate serotonin production, which makes us humans happier and more relaxed, according to the article, “Antidepressant Microbes in Soil: How Dirt Makes You Happy” from Gardening Know How.com. I’ve experienced this mood boosting effect many times when planting flowers, but I thought it was purely from the fact that I was playing in the dirt just like I used to when I was a kid. I’m not a woman who’s afraid to get her hands dirty and her work jeans too in the process as I used them as towel to wipe the dirt off periodically. As I always say, everything washes and really, the whole point of work jeans is to get them dirty. I had dirt all over my hands and under my fingernails, but I didn’t care. If I hadn’t run out of flowers, I would’ve kept planting and playing in the dirt for hours and if I had endless money and time, my entire 1.4 acres of property would be covered with flower gardens. Maybe I’ll get it to that point someday, but for now, I’m happy to play in the dirt of my planters as I bring a spot of color and joy to my home and life.